September marks the anniversary month for our Raleigh store, and always gets us to reflecting. It has been our immense pleasure to work with so many brides (and grooms too!). Now we get to see many of our couples coming into the store to pick out their anniversary cards and gifts. The history of anniversary gifts harkens back to the Roman empire when husbands would crown their wives with a silver wreath on their 25th wedding anniversary, and a golden wreath on their fiftieth. It was during the Victorian era that the tradition of giving paper on the first anniversary evolved. Another reason for us to thank the royals! Of course a new stationery suite is the perfect way to embrace this tradition! It’s a great time to get a set of stationery with your new married monogram. We love all of the fresh takes on classic monograms that Arzberger Stationers have. 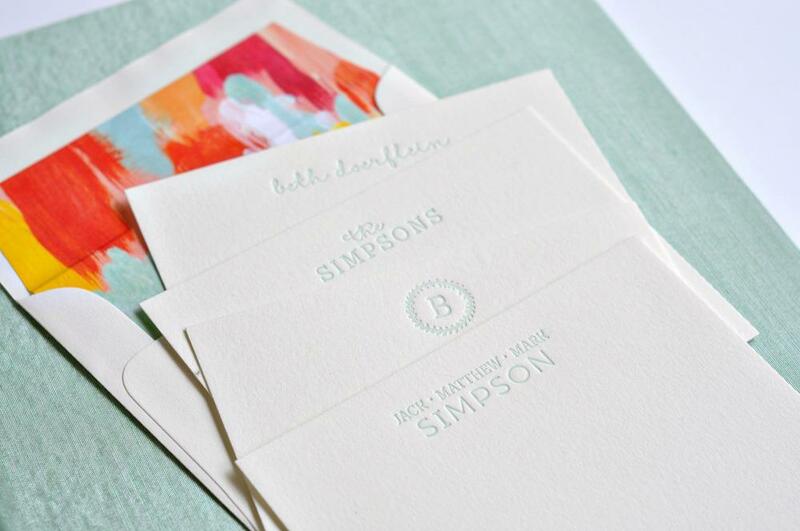 You can carry the monogram onto multiple pieces like flat cards, calling cards, half sheets and more. Stationery can have an individual’s initials, a duogram, or the first and last name. Although stationery is the most popular way to incorporate paper into an anniversary gift, you aren’t limited to it. Why not get personalized coasters, notepads, or even cocktail napkins for your at-home bar. Stop by to grab a card and let us help you pick out that perfect first anniversary gift!